Making craft beer with an electric brewery is like cooking with an electric stove instead of a campfire. We took off our beer goggles and tested the best models on the market to answer one question: what is the best home electric brewery out there? Read up to see which one is right for your man cave. 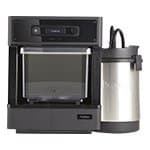 Warning: An automated brewing system sounds like every man’s dream, but it can quickly become a nightmare if you try to go cheap. We tried some budget models and the beer tasted, well, you don’t want to know. Make sure you get quality. 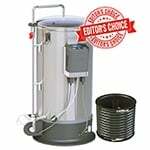 1 What’s an All-In-One Beer Brewing System? 9 How to Choose the Best Electric Brewing System For You? 11 What’s The Best Beer Brewing Machine? What’s an All-In-One Beer Brewing System? 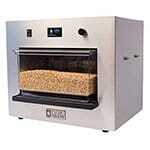 An all in one beer brewing system is an automated electric brewing system that simplifies the homebrewing process. Brewing beer at home used to require hours of labor and complex equipment. Now it’s as easy as getting a few packaged recipes and letting the machine go to work. 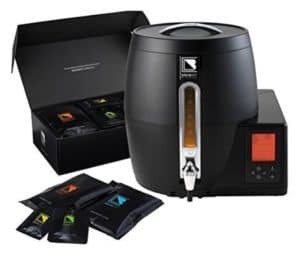 We look at some of the best all in one brewing systems currently on the market to see which machine sets each one apart. The first one we tried was the – The Grain Father, an all-in-one system that lets you be more a part of the process. We wanted to test a model that felt more like real brewing than pressing some buttons. 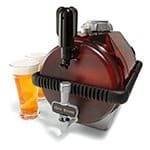 The sleek look and deep feature set come with a simple temperature control mechanism, allowing the home craft brewer plenty of control over their creation. The recirculating mash lets you create all-grain recipes fairly convincingly. 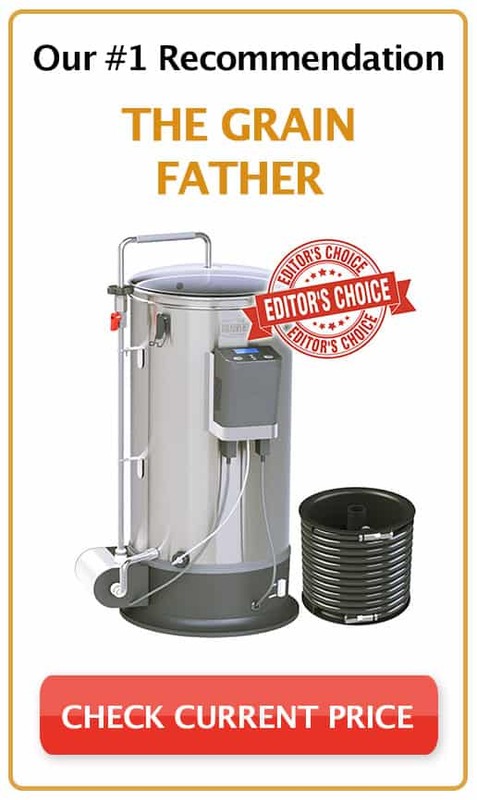 The Grain Father comes with a stainless steel body, expandable grain basket (to to different types of grain), and a built-in electric gauze filter. Many users struggle to get the temperature high enough at certain times of the year, so you might want to get this heat insulation jacket as well as an add-on to the Grain Father. The Grain Father isn’t as convenient as other models since it requires hands-on participation, but some DIY beer lovers will like that. You definitely need to follow the manual. The work was worth in our opinion though, since the beer came out pretty delicious. Check out the video below to see it in action. Next up is an automatic beer brewer – PicoBrew PICO. Light, compact, and easy to clean, this simple model was one of the first available on the market. With over 100 PicoPak (recipes) to choose from made by award-winning breweries, its “BrewMarketplace” was what stood out to us. 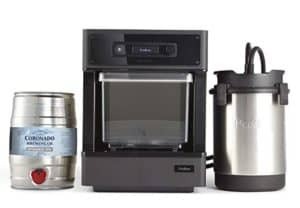 What’s really unique about this electric brewer is that you can easily adjust the beer to your liking or even customize your own PicoPak. Then enjoy. Seriously, an all-in-one automatic brewer from the push of a button. Since you can brew up to 5 liters at a time, it brings the price a single beer down a decent amount. If you think the BeerDroid looks like something out of Star Wars, you’re right. The first thing that hit us with this electric auto brewer was the futuristic design and wi-fi connection. The selection isn’t as extensive or prestigious as #1 product, but it’s still pretty good. You can brew about 2.6 gallons and monitor everything through an app. There is also a “Custom” setting that allows you to have more control over the process, but honestly, it didn’t feel that authentic to us or worth the time. In the end, the beer came out pretty good but didn’t blow us away. We tried the Zymatic to get a more hands-on experience and brew larger batches. The Model C (the little brother) is a great electric model for beginners or beer enthusiasts who want a simple machine at home to make good beer. The Zymatic is for those with a bit more experience who want to be more hands-on. It really just depends on you. This heavy-duty, stainless steel behemoth weighs in at 50 lbs and generates 2.5 gallons of brew per cycle (roughly 10 more beers than its little brother per batch). The company allows the same access to their BrewMarketplace and the same customization options. The difference is that the ingredients are pre-loaded into the machine. Since there is more work involved, you can bring the price per beer down further than others, but of course, it’s offset by the workload. The quality of the beer tasted the same to us. The Beer Machine Model 2000 requires some assembly and comes with a few confusing parts, including a plastic body that resembles an old-school pressure cooker. That being said, it does come with some pretty cool features, including a custom pressure gauge to read brew quality, carbonation level, and dispensing pressure. It even came with 6 reusable bottles. Honestly, the model is a bit of a conundrum—it’s geared toward hobbyists and only makes small batches, but it’s not nearly simple enough to set up and operate as other models. Still, we got what it promised us: decent liquid gold in about 10 days. So it looks cool and makes some solid brew. We can’t really argue with that. How to Choose the Best Electric Brewing System For You? Batch Size: Do you drink more than socially (be honest!) or do you plan on having a lot of friends over to your man (or woman) cave? 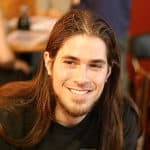 Recipes: Do you want to be master of your creation or are you fine with recipes? Some models only let you buy from their library of recipes, so you can’t actually make your own beer. Work involved: The whole point of an electric brewer is to make your life easier, but some of us still want to feel like a brewmaster and not like we’re using a Keurig to make coffee. As much as we like the idea of doing away with the expensive electronic equipment and saving hours of our precious labor, there are still some benefits to doing it yourself. What’s The Best Beer Brewing Machine? 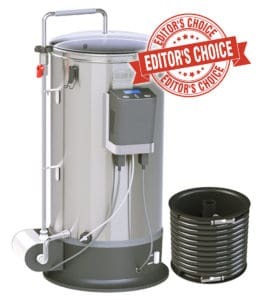 After reviewing a bunch of these automatic brewers, in our opinion, it really comes down to how much convenience you want. We enjoy brewing beer as much as the next person, but sometimes it’s nice to have the machine do all of the work for you. If we had to choose, the best would have to be The Grain Father hands down. 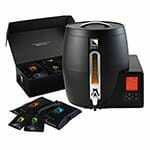 It really covers all of the bases — awesome beer, extremely simple to use, and unrivaled convenience. Setup is incredibly easy, cleaning requires minimal effort, it can be stored easily, and best of all, the footprint is small enough that you can get away with brewing in the kitchen on cold winter days. By following the instructions on the Grainfather app, we were able to hit my target numbers on all our batches. This level of precision will really step your brewing game up and it’s just something exciting for a nerd like me. I know that it’s not 100% automated, but the brewer deep down in just couldn’t let the machine do all the work – I still want to feel like I’m actually doing something. 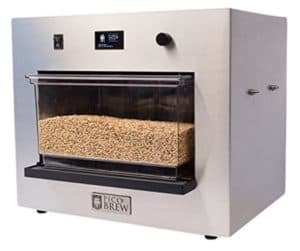 If you want something more automated, then the PicoBrew PICO Model C may be something down your alley – and it’s cheaper too if the price is a factor. If you want a greater degree of control when brewing, The Grainfather is a must.